More details of the testing procedures for the individual soil analyses can be found in the Soil Health Assessment section of the Comprehensive Assessment of Soil Health – The Cornell Framework Manual. To order tests individually, use CSHL Individual Analysis (Ala Carte) Form. To order packages, use one of these submission form options. Organic Matter Content ($9)*: The pool of organic matter (OM) in soil includes the carbon-containing solid materials which are, or are derived from, living organisms including plants and soil microorganisms. Soils with high OM content tend to require lower inputs of nutrients and are more resilient to drought and extreme rainfall. The percent OM is determined by measuring the mass loss on ignition at 500°C in a furnace. At these extreme temperatures, carbonaceous materials are burned off (i.e., oxidized to carbon dioxide (CO2)), while non-organic, mineral materials remain. pH and Nutrient Testing ($25)*: A traditional soil fertility test analysis designed for application in the Northeastern U.S. is used to determine soil pH and estimate plant nutrient availability. Results are interpreted within a general framework to evaluate deficiencies or excesses, but are not crop specific. Soil pH is measured using the Cornell pH Test; macro- and micro-nutrients are determined using modified Mehlich or Morgan Extractions. Wet Aggregate Stability ($20): Wet aggregate stability is a measure of the extent to which soil aggregates resist falling apart (i.e., slaking) when wetted and exposed to the force of rain drops. This physical soil property is measured using the Cornell Sprinkle Infiltrometer, which steadily rains on a sieve containing a known weight of soil aggregates between 0.25-2.0 mm for five minutes. Unstable aggregates slake and pass through the sieve, while the fraction of soil remaining on the sieve is used to calculate the percent wet aggregate stability. Soils with high wet aggregate stability are more resistant to water and wind erosion and show better overall soil health (e.g., infiltration, root growth, biological activity, etc.). Soil Respiration ($20): Soil respiration is a measure of the metabolic activity of soil microorganisms. Respiration is determined by capturing and quantifying the amount of carbon dioxide (CO2) released from a re-wetted sample of dried, 8 mm sieved soil stored at room temperature in an airtight jar for four days. Greater release of CO2 is indicative of a larger, more active soil microbial community participating in carbon mineralization and OM decomposition. Surface and Sub-Surface Hardness: Surface and sub-surface hardness are indicators of the soil’s compaction status, which decreases water, air, solute, and root movement through the soil while potentially increasing the likelihood of surface runoff and soil erosion. Surface and sub-surface hardness are both measured as penetration resistance in pounds per square inch (psi) using a field penetrometer or soil compaction tester at two depth increments (surface: 0-6”, subsurface: 6-18”). The Cornell Soil Health Lab can provide clients with a soil penetrometer by mail to collect hardness ratings in the field; these data can then be included for the interpretation of overall Soil Health score. Rapid Texture ($20): The non-organic, solid material in soils is composed of a mixture of mineral particle sizes, the relative amounts of which determine a soil’s texture. Textural class affects many of the important physical, biological, and chemical processes in the soil, but is not easily altered by management practices because it changes little over time. Although soil texture itself is not a soil health indicator per se, knowledge of the textural class informs the interpretation of soil health indicators. The Rapid Texture procedure involves dispersion of soil particles using sodium hexametaphosphate followed by the 1) isolation of the sand fraction using a 0.053 mm sieve, and 2) separation of the silt and clay fractions by settling. Active Carbon ($20): Active Carbon measures the portion of soil organic matter that can serve as a readily available food and energy source for the soil microbial community, thus helping to maintain a healthy soil food web. To measure Active Carbon, soil is reacted with a potassium permanganate solution which has a deep purple color. As the solution oxidizes Active Carbon, it loses some of its color. This loss of color upon reaction is directly proportional to the amount of Active Carbon in the soil sample, which is determined by using a spectrophotometer and calibrated against standards of known concentration. 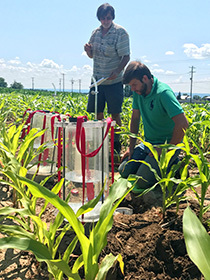 Predicted Available Water Capacity: Beginning in 2019, the Cornell Soil Health Lab moved to predict Available Water Capacity (AWC) using a random forest model, from a suite of measured sample parameters in the Standard Comprehensive Assessment of Soil Health (CASH) package. See Soil Health Manual Series Fact Sheet Predicted Available Water Capacity for a detailed explanation of the AWC prediction process. The laboratory measured AWC will remain available as an optional add-on to the CASH packages. Note: This test is not available as an individual soil analysis. Autoclave-Citrate Extractable (ACE) Protein Test ($20): The Autoclave-Citrate Extractable (ACE) Protein Index is used as an indicator of the fraction of the soil organic matter pool that is present as proteins or protein-like substances. Soil protein content is an indicator of the biological and chemical quality of the soil, and is very well associated with the overall soil health status because it represents the largest pool of organically-bound nitrogen in the soil. Soil proteins are determined using a sodium citrate extraction under autoclaving (high temperature and pressure); extracted proteins are quantified using the colorimetric bicinchoninic acid assay (BCA) as calibrated against protein standards of known concentration. Soluble Salts ($10)*: Problems with high salt concentrations can occur naturally, but are most prevalent under irrigated agriculture in semi-arid and arid areas. Although this is most commonly encountered in western regions of the U.S., issues are also associated with high tunnels used for season extension in the Northeast. High concentrations of soluble salts in soil have a severe impact on growing crops by limiting the ability of plant roots to take up water; in severe cases, this can cause plants to wilt and die. Heavy Metal Screening ($30)*: Testing for heavy metals is available for situation where soil contamination is suspected, or as a precautionary measure. Heavy metals accumulate in soils at low levels naturally, but toxic levels can be reached as a result of mining, manufacturing, and industrial activities. Contact with heavy metals is dangerous for humans and animals, but can also have adverse effects on plants and soil organisms. Metals falling under this category include arsenic, barium, cadmium, chromium, copper, nickle, lead, copper, and zinc. To extract heavy metals, a soil sample is digested using acid; quantification of metals in extracts is then performed using Inductively-Coupled Plasma (ICP) atomic emission spectroscopy. Root Health Bio-Assay ($20): Root pathogen pressure is a measure of the degree to which sensitive, test-plant roots show symptoms of fungal disease pressure when grown in a soil sample for a set amount of time under controlled conditions. This assessment is qualitative and reports either the absence or presence of symptoms of damage from a variety of root fungal (e.g., Fusarium, Rhizoctonia, and Thielaviopsis) and oomycete (e.g., Pythium) pathogens which can cause major crop retardation or death if not kept in check. The apparent pathogenic pressure is given a rating from 2 to 9, with higher numbers indicating greater levels of pathogen-induced damage. Available Water Capacity ($20): Available water capacity is the amount of plant available water the soil can store. In the field, a soil is at the upper end of soil wetness when water that it cannot hold against the force of gravity has drained – this is called ‘field capacity.’ The lower end of the range is referred to as the ‘permanent wilting point,’ which occurs when only hygroscopic water remains (i.e., water tightly held so tightly onto soil particle surfaces that it is inaccessible by plant roots). Available water capacity is determined from measuring the soil’s water content at both field capacity and permanent wilting point in the lab and calculating the difference. Note: New for 2019. This soil analysis has been replaced by Predicted Available Water Capacity in the Standard and Extended packages and is only available as an add-on test. Hot Water Soluble Boron ($15)*: Boron is an essential plant micro-nutrient especially important for many fruits, vegetables, and hops. Boron availability is expected to be low in soils with high pH, low organic matter content, low moisture, and limiting nitrogen availability. Hot water soluble boron is extracted from the soil by boiling with 0.125% barium chloride solution. The extract is then filtered and analyzed for Boron concentration using Inductively-Coupled Plasma (ICP) atomic emission spectroscopy. Potentially Mineralizable Nitrogen ($45)*: Potentially mineralizable nitrogen (PMN) provides an estimate of the amount of nitrogen available in the soil for plant uptake. PMN is the portion of the organic nitrogen pool which is most easily decomposed by soil microorganisms and converted into ammonium via mineralization. PMN is generally higher in soils with high accumulations of organic matter and total N, such as those in low lying landscape positions which inhibit aerobic decomposition. Soil PMN is determined by measuring the amount of ammonium produced during a seven day anaerobic incubation at 30 °C and comparing this with the initial, background concentration of ammonium pre-incubation. *Note: Some individual soil analyses are performed by the Cornell Nutrient Analysis Laboratory. These soil analyses are indicated by an asterisk (*). If you are only requesting tests with asterisks (for example, Organic Matter* and Heavy Metals*) please submit soil to the Cornell Nutrient Analysis Laboratory for these soil analyses. If you are requesting individual soil analyses which include asterisks and those which do not (for example, Texture and Organic Matter*) please use the Cornell Soil Health Laboratory Individual Soil Health Analysis Submission Form. Please contact Kirsten Kurtz with any questions.